Setup instructions for the new, unreleased Iris Care Pendant. A new Iris Care Pendant is coming! Just last week we dug through a pile of recently filed FCC documents revealing some insight into what lies ahead for Lowe’s Iris. What we did not report at the time was the discovery of a new Iris Care Pendant which is being developed to replace the current pendant. This new care pendant is reported to be a little smaller in size compared to the current device; the transmitter measures in at a respectable 1.75″ wide x 2.00″ tall x 0.60″ thick. This revised care pendant will be powered by a single CR-2450 lithium coin battery with an estimated life of 2 years. The pendant appears to have a single, large button in place of the previous versions two buttons. 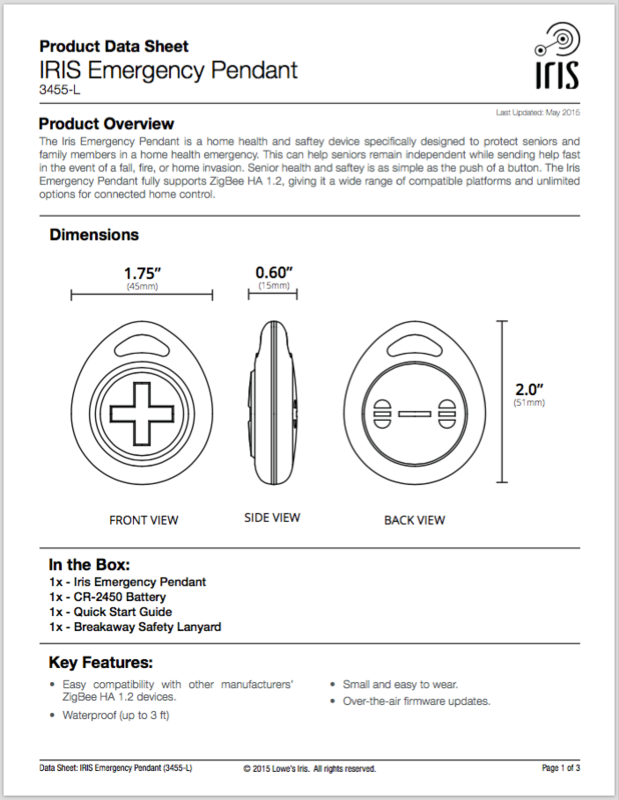 The package will include the Iris Care Pendant with pre-installed CR-2450 battery, Breakaway Safety Lanyard, and User Guide. As with the other newly discovered devices the new care pendant has a feature referred to as Pull-to-Pair, where removing a plastic tab from the battery compartment is all that is required to complete the initial setup and pairing. 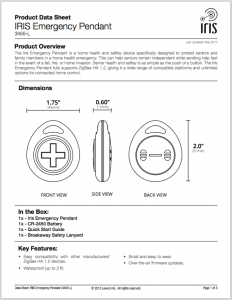 The device appears to have only a single, larger button and can be attached to a keychain or the supplied lanyard.